Travertine is a unique and gorgeous natural stone. Travertine is stone that is in the process of turning to marble. This stone contains voids and holes that are from air pockets that have been trapped within the stone in its natural environment. Often times, when using travertine in a home, these holes are filled to avoid problems such as, staining and water damage. This porous stone comes with vulnerabilities that must be accounted for in order to maintain the gorgeous appearance, and preserve the stone for years to come. Like many natural stones, travertine is notably sensitive to acids and alkalis. These types of materials are found in all kinds of household items and cleaners. You will want to be careful using any household cleaning supplies that have not specifically been made for natural stone flooring. You can find harmful properties in simple things such as wine, tomato sauce, soft drinks, even moisture and mud tracked in on your shoes. This is why one of the most effective ways to protect your travertine floors is by providing a strong, protective sealant. This will give your travertine a glossier finish. A strong sealant will guard the stone against harsh chemicals, spills, scratches and other harmful influences. If a spill is to occur, immediate attention must be given to avoid a long term issue because the stone rapidly absorbs liquid as it is porous. You will want to be careful to only use mild cleaners made for natural stone on your travertine floors. To truly protect and maintain your travertine floors you will need to schedule regular professional maintenance. 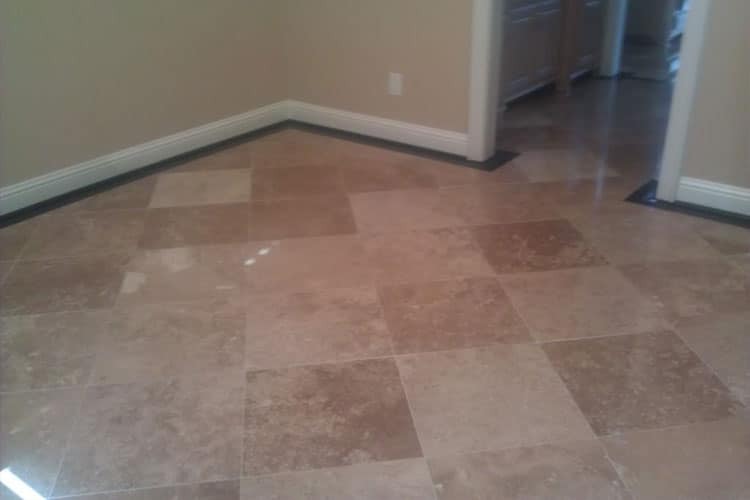 Even if you keep your floors spotless, you will not be able to get your travertine as clean or protected as professionals with the proper equipment.